How do you drive a rover on Mars? The latest rover to land on Mars, Curiosity, represents a huge leap forward in technology for exploring the planet. At 875 kilograms and ten feet long, it is about twice as long and five times as heavy as NASA’s twin Mars Exploration Rovers, Spirit and Opportunity, which launched in 2003. Landing, powering and controlling such a complex and sophisticated machine from hundreds of millions of miles away represents a big challenge (especially if you want to avoid this happening). The first challenge is the landing – we’re used to seeing footage of rovers ‘crashlanding’ into the surface of Mars, and bouncing around in a protective tetrahedron of air bags, before unfolding themselves. This is how Opportunity and Spirit were both landed back in 2004. But Curiosity, being much larger and heavier, needed to land with much more precision. The spacecraft has been designed to steer itself during descent through the atmosphere, with the rover attached to its underbelly. Slowing itself down with parachutes and retro rockets, it lowered the upright rover on a tether onto the surface of Mars, touching down at about 6.30 am on Monday morning, UK time. ‘We woke up one morning and realised we were bogged down in the sand. So the engineers used a simulation with a rover on earth and did a series of experiments. The rover drivers predicted that if they did this, this and that, after 200 wheel revolutions the rover would just lift up in the sand and drive away. This took about six months to work out, we waited nervously, then we started driving it. After about 220 revolutions the rover popped out, and off we went. Opportunity was intended to last for ninety Martian days, which it spent exploring a small crater it had landed in. It was at that point the rover got stuck in sand dunes, but after escaping, it just kept on going. After eight and a half years, Opportunity is still exploring the Martian surface, carrying out experiments and sending results back to Earth. So will Curiosity manage to outlive its own life expectancy by such a huge amount? Probably not. Being nervous about the issue of dust, NASA had already designed the next rover to have a nuclear power source – a much more reliable form of power. This is expected to last for two Earth years, producing electricity from the heat of the radioactive decay of plutonium-238. During that time, Curiosity will carry out sampling and analysis of rocks by drilling holes into them, even vaporising them, to determine their composition. The results will be transmitted back to Earth using radio relays via Mars orbiters, taking about fifteen minutes to reach us. ‘With every rover we send, the technology gets more sophisticated’ said Grotzinger back in 2010. 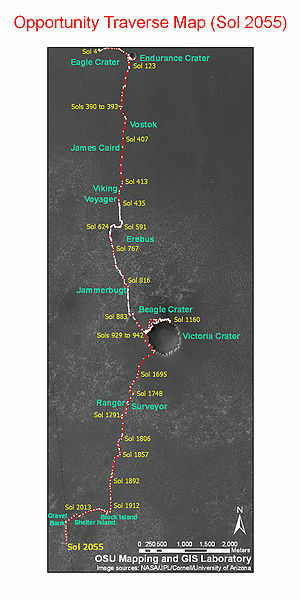 The next stage will be a rover which is capable of collecting samples and bringing them back to Earth. That could happen in the next decade, if proposals from NASA and ESA go ahead. It will be a long time before that step is taken – but you can’t help wondering if the first human on Mars might bump into the Opportunity rover, still crater hopping its way across the planet. Tags: Curiosity rover, expedition, geology, Mars, nuclear power, Space, technology. Bookmark the permalink. Previous post ← Olympic Games count down…!